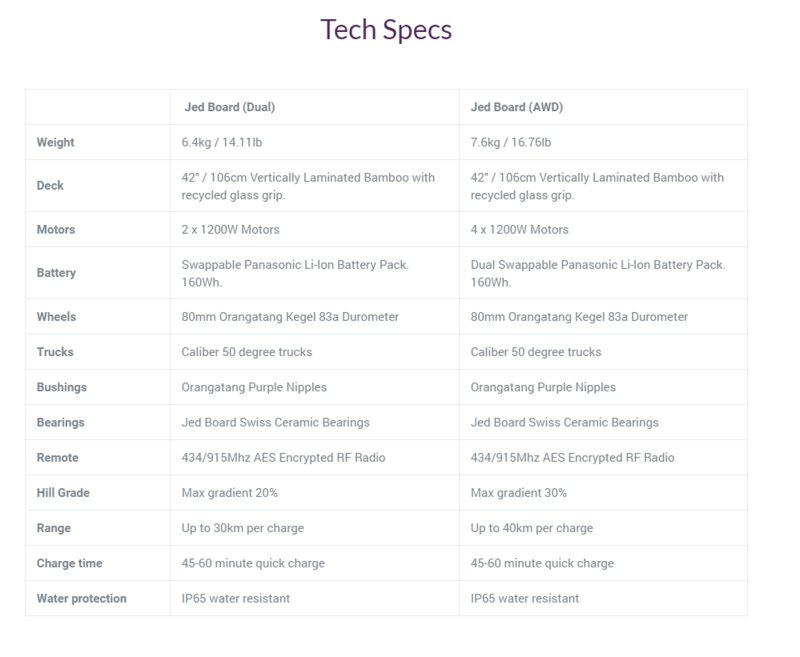 The Jed board is a fairly new board to the electric skateboard scene joining the likes of Evolve, Boosted, Inboard, Enertion Boards, Baja Boards and even the budget friendly Meepo Board. I’m deliberately not going to go into too much detail as things will probably change when the final production version of the board ships and I’ll save the more in-depth review, analysis and tests for the final release of the board, but I can tell you a little about the pre-production board I rode, the specs and my personal experience. The Jed board’s deck is made from a solid core of laminated bamboo and uses full urethane Orangatang Kegel 80mm wheels with the prospect of 90mm and 100mm options once in full production. The remote we were using on the day was the pre-production remote but the final design of the remote with all it’s features looks amazing, with a built in display, a dead man switch if you drop the remote it will gently bring you to a stop, turn my turn navigation feedback and more. The batteries are the Panasonic 18650 LiMnO2 batteries which Jed claim to be among the safest and most stable batteries available with of course regenerative braking being able to give charge back to the batteries. The Jed board features a direct drive system to the wheels which means no belts or motors in the wheels which some say has it’s advantages. It definitely allowed a lot more free roll when no power was given to the board, which enabled it to just kept on going, which is great because with a light touch and lots of free rolling you might be able to push this thing further than the advertised 30km range but that is yet to be tested and something I’d be curious about. If you did lose power completely you could just kick push this thing like a regular skateboard no problem until you found a charge. But the most important bit of text is right here, specs aside, how did the board feel? Short answer: It felt great. I felt safe and secure on the board from the moment I stepped on. I did start off in the restricted mode to get a feel for the board and it was in no time at all I was zipping around wanting more power. I had heard videos of earlier versions of the board and the noise is something a lot of people have been talking about, trying this board was surprisingly quiet compared to earlier versions and I was told the final release should be even quieter, and I have no reason not to believe that. Turning and carving felt nice and smooth and can be further tweaked to your liking by adjusting the trucks. The thing that surprised me the most was the amount of free roll on this board. I was able to give it bursts of power and just let go and cruise around for days without giving it any more power. An important thing with electric skate boards when going fast is of course the braking. You do not want a board to just come to a complete stop immediately when you hit the brakes or you are just going to fly right off, you want a nice gentle curve in the braking, so you stay safe even in an emergency situation causing you to brake fast. The braking on the the pre-production board was pretty good, it took some getting used to, to get a feel for how much braking you get for how hard you push back on the remote and that’s just something you have to get used to with every board. The final release will have further tweaks to the braking curve and possibly the ability to adjust it yourself in the app. There was no app to test at this stage and is another thing we will have to wait for in the final release of the board. At no time did I feel unsafe riding the Jed Board which is a big deal for a piece of wood that can propel you to 40km/h, granted I didn’t go that fast but if you don’t feel safe even at slow speeds you don’t stand a chance. I had an absolute blast riding around on the Jed and didn’t want the afternoon to end. I look forward to seeing what tweaks they make to the board on final release, the new remote and the mobile app. Keep an eye on on TechWrap.net and all the socials for a final review of the board once full production in underway.